Bathroom Surgery! When Ingrown Nails...go really bad! When Ingrown Nails...go really bad! In my 5 years of practice I have had 3 patients who let an ingrown nail get so badly infected that the underlying bone became infected and resulted in an amputation for the patient. On a weekly basis, I see many patients for ingrown nails. The majority all have a similar story of how it's been a problem for a while. The patient tried to trim it out themselves (bathroom surgery), and they couldn't get it. The toe will be red, inflamed, draining, and almost screaming for HELP!!! The seriousness of the issue is that if there is long standing infection or if the patient's immune system is compromised, such as with Diabetes...this can lead to drastic problems. Two of the three patients that ended up with an amputation did have diabetes and decreased sensation, so they did not realize the severity of the issue. The third patient was a young 28 y/o female that did not have insurance and let the ingrown nail go for over 8 months. The bone lies very close to the base of the nail and it does not take much for it to get infected. 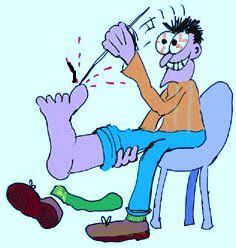 Bottom line, if you have an ingrown nail contact the professionals at Indiana Podiatry Group to get it resolved.